Somtow's World: Vive La Revolution! This has been an absolutely amazing week of ups and downs, drama, delusion, and divine madness. First came the concert at Thailand's "ground zero", Central World. Yes, I did hear from a few fanatic yellow shirts who called me to say, "Thank you for claiming back our territory!" To which I would reply: "Excuse me? This territory belongs to EVERYONE. That was the whole point of the concert." On the whole, people did understand this, and understood also that where words fail us, sometimes it can be music that brings us together. The Mahajanaka gala was not beset by any kind of backstabbing; the worst that could be said of it was the organizers had little experience with a big classical music event and perhaps didn't realize just what a major symbol it could become (though they did by the end.) Everything was smooth and what disagreements there were were easily assuaged. But then again, the concert was organized by private citizens, not by a government or political party. So none of us was trying to get reelected. It was certainly amazing to perform there on the King's Birthday and to perform music inspired by the story of the Mahajanaka; this is a story that tells us, indeed that the Avatar of Buddha was rewarded for his perseverance when an angel appeared to lead him on to his destiny. It's often read that way: persevere and you'll see your guiding angel. But I would go further and say that the story means that unless you sacrifice everything, that angel isn't going to appear. God, or "the gods", if such there be and the jury is certainly out on this question, has a tendency not to show up until you have given and given and given of yourself until there is nothing left. At that point, a space opens up within yourself. It is in that space that revelation comes. Ask any messiah. 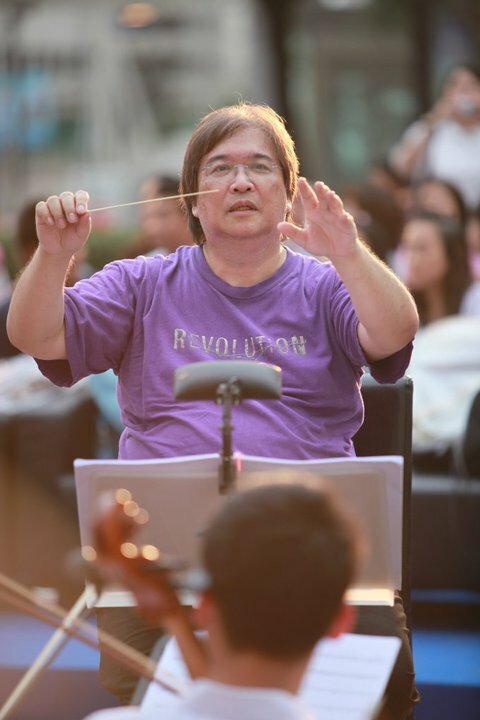 After the Dec 5 concert comes "World Opera Week" — from a huge blockbuster CARMEN presided over by the Queen to a wild avant-garde romp at the Bangkok Art and Culture Center. And it all starts on Monday with SAVITRI —the Thai and possibly Southeast Asian premiere of a rare and gorgeous opera by Gustav Holst, conducted (in his operatic debut) by the young Nadanai Laohakunakorn. I hope to see a lot of you there. Vive les gens de la musique!!!! !